SEBA KMT are the leading manufacturer of measurement equipment for the diagnosis of cable networks and for cable fault location. Cable faults are the ''natural enemy'' of reliability. The innovative SebaKMT products make it possible to quickly localise low and high voltage cable faults without causing damage to fault-free parts of the cable. 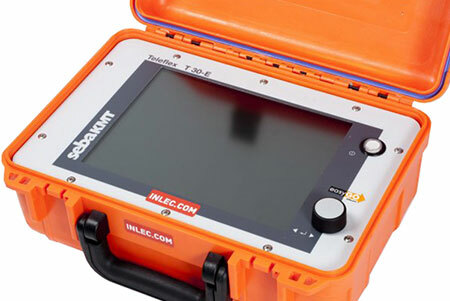 Cable Fault Location Using Time Domain Reflectometry (TDR) - TDR cable fault locators send a low-energy signal through the cable, causing no cable insulation degradation. A theoretically perfect cable returns that signal in a known time and in a known profile. Impedance variations in a "real-world" cable alter both the time and profile, which the TDR screen or printout graphically represents. This graph (called a "trace") gives the user approximate distances to "landmarks" such as opens, cable splices, Y-taps, transformers and water ingression. One weakness of TDR cable fault location is that it does not pinpoint LV-HV faults. TDR is accurate to within about 1% of the cable testing range. Sometimes, this information alone is sufficient. Other times, it only serves to allow more precise cable thumping. Nevertheless, this increased precision can produce substantial savings in cost and time. A typical result is "438 ft 5 10 ft." If the cable fault is located at 440ft, you only need to cable thump the 20ft distance from 428ft to 448ft, instead of the entire 440 ft. Another weakness of TDR fault locators is that reflectometers cannot see faults-to-ground with resistances much greater than 200 ohms. So, in the case of a "bleeding fault" rather than a short or near-short, TDR is blind.